It’s a difficult question, hard to answer in just a single sentence. Maybe you give because you feel obligated by a kindness that was once passed to you. Perhaps you give to set an example for your children. Maybe it was your friend’s birthday, and you gave them a gift to make them feel appreciated. What about the spare change you gave to a stranger for a bus ride home in the rain? How did giving make you feel? The truth is that giving is an experience threaded into the daily lives of most people. We give currency in exchange for a full stomach. We give handshakes, hugs, and waves. We give presentations, we give dinners to our families. It might not seem like giving while it’s happening, but this quality is exactly what makes acts of kindness so mysterious and so special. Giving is hard-wired into who we are as human beings — and not surprisingly, so is receiving. We receive the bag lunch our parents pack for school. We receive report cards, phone calls, hand-me-downs, and shelter. We receive opportunities, clean drinking water, and prayers. Most people like receiving things because it makes them feel connected, it makes them feel like a part of something bigger than themselves. Would you have guessed that people like giving for the very same reasons? Research has shown that giving usually makes people feel some kind of happiness, even if that giving requires a small sacrifice. It has also been demonstrated that happy people tend to give more. But rather than struggle down the rabbit hole of defining what exactly it means to be happy, we turned to social media (a place where people share how they feel about things) to find more clues. Do giving and receiving really make us all feel the same way? Within each of these categories we filtered and refined our data by examining a spectrum of filter words (for example, honing in on child-centric areas like pumpkin patch, kids, and children for better Halloween results). After averaging the emotional scores for all tweets, we created radar charts to visualize the data. 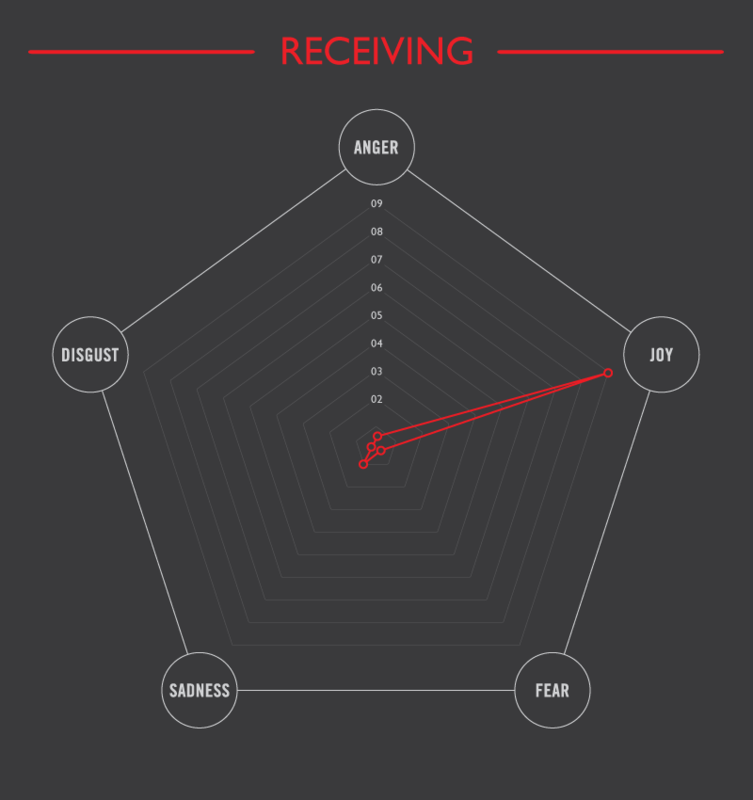 Sadness scores suggest empathy strongly influences how we feel when giving. This makes sense. Empathy is an individual’s ability to share the emotions of other people, so feeling another person’s sadness can certainly spark in us a desire to make that person feel better. After all, it’s what we would want if we found ourselves in similar shoes. If we can accept that giving is a part of who we are as people, then it should also be easy to understand that empathy can be exhausted. This means that it’s possible to give too much, or to give for the wrong reasons. In fact, research suggests that giving to others because you feel obligated or because you want a short-term reward can have detrimental impacts on your mental health and social behavior — it can make you less compassionate for others and disappointed over a long period of time. Giving, whether it’s a donation, a birthday present, or a dinner, should always feel natural. It should always be a reflection of the values that define you. It should be like planting a seed that you can watch grow into a forest. Empathy extends beyond human-human interaction to animals, and our environment. Pet adoption is a particular hybrid of giving and receiving: a person brings an animal without a family into their own. For the adopter, they are giving the pet love, food, and shelter, and in return they are receiving a companion that responds with consistent appreciation. Although the original motivation for adopting the pet may be rooted in sadness (sadness that a dog or a cat is living in a cage, for example), the joy associated with giving that pet a better life far outweighs any associated sadness or sacrifice. 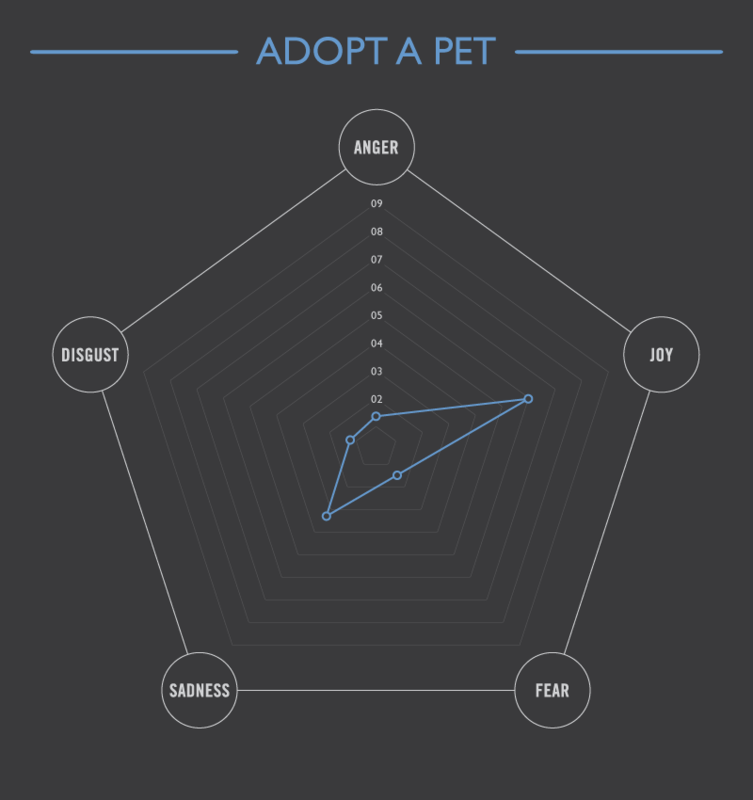 A comparison of emotions for “giving” events and pet adoption. Giving is a very broad event, so the levels of joy and sadness or disgust felt around these events are balanced. Pet adoption, which requires a big commitment of giving and a sacrifice (a sacrifice of time, money, and effort to raise a pet and keep it healthy), still skews strongly toward joy. It is almost as if people require the ability to feel sadness in order to act on the desire to bring joy to others. This doesn’t mean being sad or depressed by default; it means empathy. It means willingness to try on shoes that aren’t your own. Joy is more powerful than sadness. Humans survive as newborns by receiving food and water and shelter, not by reciprocating appreciation for those things. Parents bring children into the world with the understanding that their babies cannot grow into strong young adults without constant nurturing. The joy that we feel when we receive something is fundamentally rooted in our survival instincts. It feels good to have a full stomach when you are hungry for the same reason that it feels good to get the gift you’ve always hoped for: because you hunger for something, or, because that gift satiates an emotional hunger. You don’t need to give everything you have in order to feel good about giving. You don’t need to give the most expensive gift, or a gift worth any money at all. The very gesture of goodwill associated with an act of kindness is enough to bring positivity into our lives, to make us feel joy. That our gift could multiply or change someone’s life in a way that makes the world a better place is just an added bonus to doing and feeling good. What can a dollar actually buy? Although this is a question we might ask ourselves only occasionally, the answer is always changing and always gives new perspective. Money is a unique lens through which to observe the effects of giving and receiving — it’s collateral that we’re all familiar with. And it’s easy to get swept away in all of the receipts and dollars that pass hands to allow us to live our lives the way we do. Toys hold special value as tokens of memory and entertainment, but sometimes even the best ones collect dust over time. 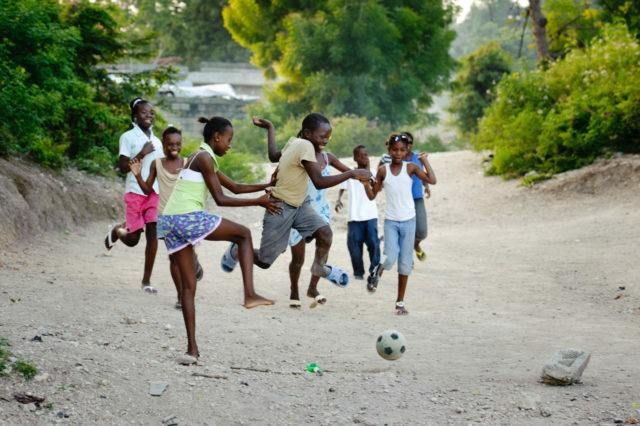 For a village in need of food, the value of a single toy grows roots and becomes a grove of fruit trees that provide sustenance for generations. Sometimes, it’s the smallest changes that have the greatest impact. There are always creative, cost-effective ways to bring family and friends together if you’re not afraid to try something new. Could the savings from dinner and a movie on the couch really change a family’s life? Money is a fluid object: we all know what it is, yet everywhere it means something different. How far does a dollar really go? 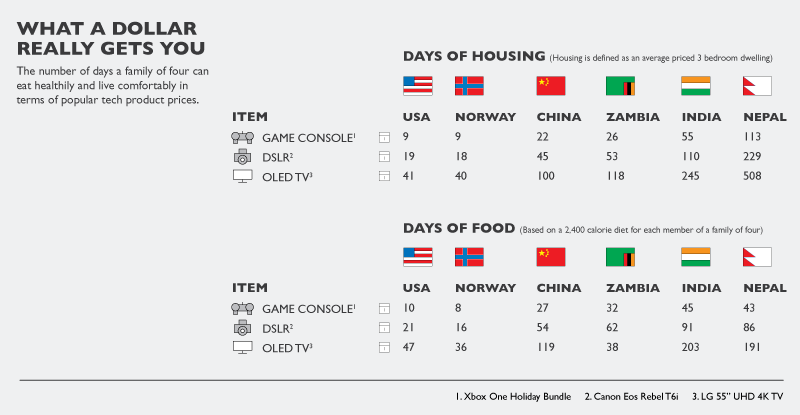 Would you have ever thought it possible that a common gaming console’s value could feed a family of four for more than half a year? 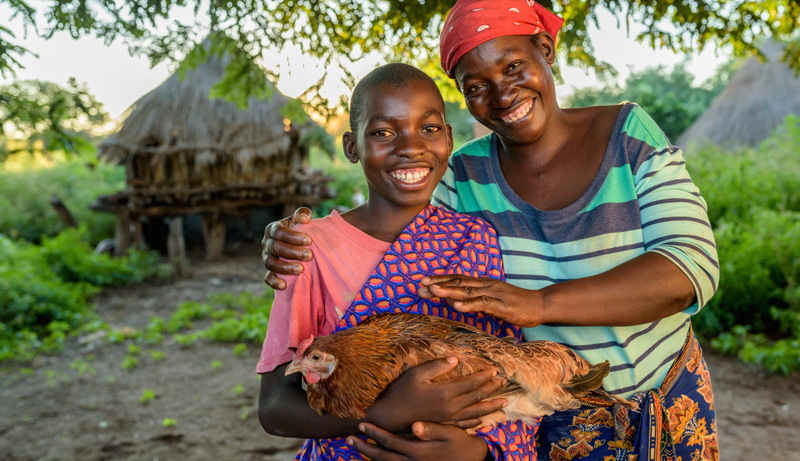 The World Vision Gift Catalog has more than 100 life-changing gifts.